Bible teacher Kelly Needham debunks our world's constricted, small view of friendship and casts a richer, more life-giving, biblical vision for friendship as God meant it to be. As the family unit grows more unstable and the average age of marriage increases, a shift is taking place in our culture: for many people, friends now play the role of family. And just as with family relationships, our friendships often don't turn out quite as we envisioned or hoped, and we wonder, Is there a better way to do this? In Friend-ish, Kelly Needham takes a close look at what Scripture says about friendship. She reveals the distorted view most of us have of it and recasts a glorious vision for a Christian understanding. By teaching us how to recognize symptoms of idolatry and dependency, she equips us to understand and address the problems that arise in friendship--from neediness to discord and even sexual temptation. With hard-fought wisdom, a clear view of Scripture, and been-there perspective, Needham reorients us toward the purposeful, loving relationships we all crave that ultimately bring us closer to God. 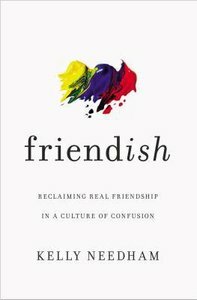 About "Friend-Ish: Reclaiming Real Friendship in a Culture of Confusion"